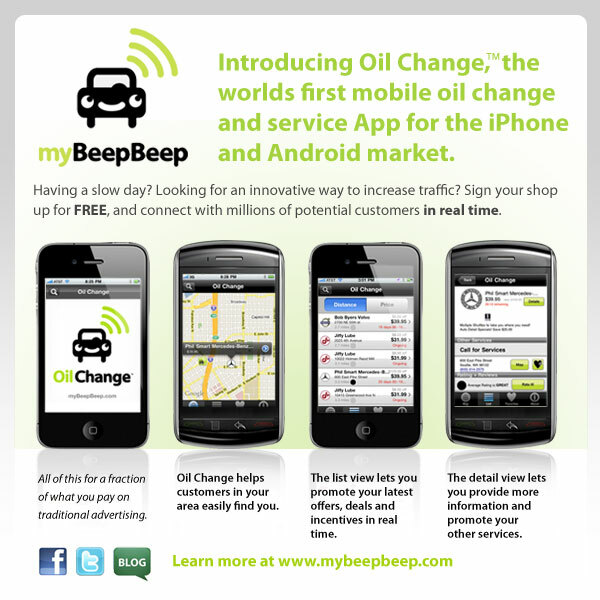 myBeepBeep Blog: Will this app change how you get you Oil Changed? Follow this link to Oil Change on the iTunes Store http://itunes.apple.com/us/app/oil-change/id359191406?mt=8 to view the apps features and description. How it works:Shops can go to www.mybeepbeep.com to sign up and start advertising for FREE or view a demo video of the features and sign up for future announcements. This innovative approach to advertising and promoting the Fast Lube & Auto Repair Industry will allow shops to connect with and advertise to customers in REAL TIME! Have you ever seen a Lube tech standing by the street in front of a shop waving a sign that reads "$5 off right now"? This is the modern version of that without the cost of paying a full time technician to advertise. Shops can advertise other services as well like Car Washes, Filters, Flushes, Wipers, Exhaust or Tune-ups to set them apart. This is not a discount site per say; this is a way for shops to promote their services in a versatile and affordable way. Shops can sign on, complete a unique business page, create an advertisement and change or place that advertisement as many times as needed per day, week or month! A shop may be slow at 8am but have customers by 11am, now they can advertise when they need customers. Customers will be able to find a shop that fits their needs by allowing the app to locate them automatically and sort the shops by Distance, Price, Deals Offered and the type of maintenance their vehicle needs. This is a versatile advertising tool that can allow shops to emphasize the value as well as the quality of their services to 45,000,000 customers in a convenient and affordable way. Shops will be able to connect with their customers which will give them a huge advantage over the competition. myBeepBeep Media is offering this exciting new advertising tool for a limited time for FREE to Fast lube and Automotive shops! Go to www.mybeepbeep.com to sign up with NO OBLIGATION! The Consumer:Oil Change? ...there's an app for that! myBeepBeep Media LLC has released an app called "Oil Change" for the iPhone, iPod and iPad. Shop for the Best shop in your area by Distance, Price or Services and Rate them too. This is the first iPhone app for people who get their vehicle serviced at Fast Lube shops. "Oil Change" the iPhone app is available on the apple iTunes store NOW. *CONTACT YOUR FAVORITE SHOP EASILY - Call them with one simple TAP, no more looking for their phone number or guessing if they can fit you in. *SAVE MONEY - List shops by Price and Distance, Services and qualifications, see instant coupons, deals and incentives from your favorite shop on your phone in REAL TIME!